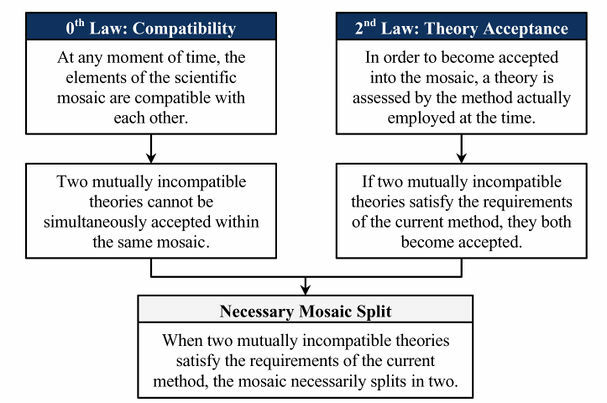 An attempt to answer the question of Mechanism of Mosaic Split which states "When two mutually incompatible theories satisfy the requirements of the current method, the mosaic necessarily splits in two." Necessary Mosaic Split theorem was formulated by Hakob Barseghyan in 2015.1 It is currently accepted by Scientonomy community as the best available theory on the subject. Like the broader topic of the Mechanism of Mosaic Split the matter of possible mosaic split has classically been regarded as a case of divergent belief systems in communities that arises necessarily from a set of circumstances. Consequently the most directly relevant literature comes from the positivist era, though some relevant work was also done in the post-positivist era. Necessary Mosaic Split theorem (Barseghyan-2015) is an attempt to answer the following question: What happens to a mosaic when two or more similar theories are considered equally acceptable by a scientific community? Under what conditions does a mosaic split occur? What happens to a mosaic when it is transformed into two or more mosaics? As shown in the figure above, the necessary mosaic split theorem follows as a deductive consequence of the second law and the zeroth law. Per the zeroth law, two incompatible elements cannot simultaneously remain in a mosaic, and per the second law any theory that satisfies the method of the time (and the assessment of the theory by the method is not inconclusive) is accepted into the mosaic. This creates the apparently contradictory situation where either of the two theories A) must be accepted because it satisfies the employed method and B) must not be accepted because it in not compatible with another accepted theory. The necessary mosaic split theorem is thus required to escape the contradiction entailed by the acceptance of two or more incompatible theories. In a situation where this sort of contradiction obtains the mosaic is split and distinct communities are formed each of which bears its own mosaic, and each mosaic will include exactly one of the theories being assessed. By the third law, each mosaic will also have a distinct method that precludes the acceptance of the other contender theory. Two examples are helpful for demonstrating mosaic split, one formal example and one historical example. Suppose we have some community C' with mosaic M' and that this community assesses two theories, T1 and TSubscript text2, both of which satisfy M'. Let us further suppose that T1 and T2 both describe the same object and are incompatible with one another. According to the second law both T1 and T2 will be accepted because they both satisfy M', but both cannot simultaneously be accepted by C' due to the zeroth law. The necessary mosaic split theorem says that the result will be a new community C1 which accepts T1 and M1, which precludes their accepting T2. Simultaneously a new community C2 will emerge which accepts T2 and the resulting theory M2, which precludes their accepting T1. Barseghyan illustrates the necessary mosaic split theorem with the example of the French and English physics communities circa 1730, at which time the French accepted the Cartesian physics and the English accepted the Newtonian physics.p.203 These communities would both initially accepted the Aristotelian-medieval physics due to their mutual acceptance of the Aristotelian-medieval mosaic until the start of the eighteenth centuryp.210 but clearly had different mosaics within a few decades. According to the second law both the Cartesian and Newtonian physics must have satisfied the methods of the Aristotelian-medieval mosaic in order to have been accepted, but since both shared the same object and posited radically different ontologies they were incompatible with one another and could not both be accepted, per the second law. The necessary result was that the unified Aristotelian-medieval community split and the resulting French and English communities emerged, each with a distinct mosaic. This page was last modified on 11 January 2018, at 16:22.